Burials at sea are sometimes preferred over traditional ground burials. Burial-at-sea funeral services are the disposal of a human body after death, by ship or aircraft. Generally, either the captain of the ship or aircraft, or a minister, priest, rabbi or other religious authority performs the ceremony. Most captains of ships in the United States are authorized to conduct burials at sea. 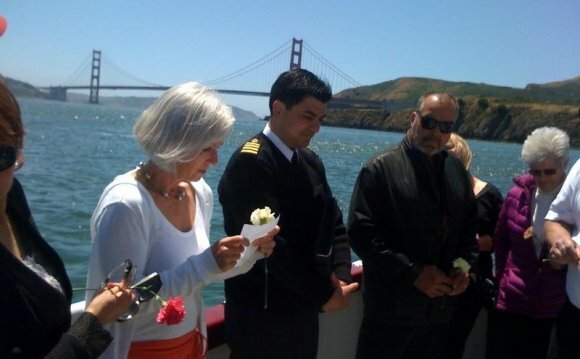 The United States Navy performs burials at sea frequently, to honor their retired veterans. They require a metal casket for sea burial, but remains may also be buried in sailcloth, urn, or the ashes may be scattered. The ceremony itself involves a few different aspects. Burial at sea by aircraft is usually done only with cremated remains, but other types of burial at sea include the mixing of the ashes with concrete and dropping the concrete block to form an artificial reef. Following the burial at sea, an official, state-notarized certificate of burial is generally offered to the family of the deceased. Flowers and wreaths made of materials that are decomposable may be buried at sea with the body. The Captain, or an appointed religious authority, conducts the service. Family members and friends gather together on the deck of a ship. Prayers are read: these can be both sea-burial related prayers, or traditional funerary service prayers that would be given, depending on faith, at a regular service. If cremated, the urn may be dropped into the ocean following the final prayer. If the ashes are to be scattered, a member of the family will scatter them over the waters, though frequently family and friends will share the task. If the body is placed in a casket, it will then be dropped into the waters, with flowers or wreaths. Prayers for burial at sea are not unlike prayers for regular funeral rites, such as burial of a body in the ground, though most make direct reference to the waters. A common Protestant prayer for burial at sea, for example, goes as follows: "We therefore commit the earthly remains of [Full Name] to the deep, looking for the general Resurrection in the last day, and the life of the world to come, through our Lord Jesus Christ; at whose second coming in glorious majesty to judge the world, the sea shall give up her dead; and the corruptible bodies of those who sleep in him shall be changed, and made like unto his glorious body; according to the mighty working whereby he is able to subdue all things unto himself. Amen." An example of a Catholic prayer for burial as sea makes direct reference to the waters in which the body is immersed: "Lord God, by the power of your Word you stilled the chaos of the primeval seas, you made the raging waters of the Flood subside, and you calmed the storm on the Sea of Galilee. As we commit the earthly remains of our brother/sister [Full Name] to the deep, grant him/her peace and tranquility until that day when [name] and all who believe in you will be raised to the glory of new life promised in the waters of baptism. We ask this through Christ our Lord. Amen." Where can you scattering ashes?